Wilsons Promontory (Prom) is a leisurely 200 kilometre drive from the Victorian capital of Melbourne. The picturesque national park was established in 1898, covers some 49049 hectares and is located at the southernmost point of Australia. This beautiful spot looks out across the wild and untamed seas of the Bass Straight, and is extremely popular with campers and holidaymakers alike. Wilsons Prom offers many things for the family. There are several different bushwalks to enjoy ranging from a couple of hours to 3 days. There is so much to see including massive granite mountains, beautiful untouched open forests, lush rainforests, as well as magnificent beaches and coastlines. There is even the light station that sits on a tiny peninsula extending into the turbulent waters of the mighty Bass Straight. The waters surrounding the Prom are extremely important and are therefore protected as a marine national park. The diving in these waters is truly spectacular and should not be missed. The main camping area is called Tidal River, where there are 484 camping sites available including 20 powered sites. This site has all the amenities you could possibly need including toilet blocks with hot showers, laundry facilities, stations for washing dishes, and playground and picnic areas complete with free gas barbeques. It is important to note that generators and fires of any sort and not permitted. Fuel is not available for sale at Tidal River, so make sure that you always have enough to get to the nearby towns of Yanakie, Fish Creek or Foster. The general store in Tidal River offers a basic range of services including supermarket and emergency items, hot and cold takeaway food and a minor range of gifts and souvenirs. But like all camping holidays, it’s a good idea to be as self-sufficient as possible. If you are stuck for some essential items it is a thirty minute drive to Yanakie, where the general store stocks a larger range of products, or even South Gippsland where the many shopping precincts should carry most of what you may require including an array of camping equipment. Tidal River Camping is located in the centre of the park and therefore makes a great base for the adventurous camper. This spot is even the home of one of Australia’s oldest out-door cinemas, so after a day of hiking you can relax on a comfy bean-bag and take in a movie under the beautiful night sky of this amazing place. Also at the park are mobile phone charging stations, and for a small refundable deposit you can use them and stay in touch with the world, should you want to of course. 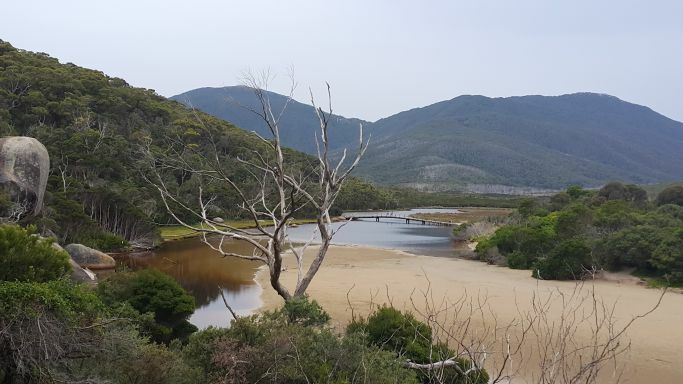 There is a smaller camp a few kilometres south-east of Tidal River called Telegraph Saddle where you will find that most of the hiking in the area starts from. There is a free shuttle bus that runs between Tidal River and Telegraph Saddle that operates on weekends between November and April. This shuttle service also operates every day during the summer and Easter school holidays. It is from here that you will commence the hugely popular Sealers Cove day walk. Located right at the entrance of the park is Stockyard Camp, which is 30 kilometres from the popular Tidal River camp. This campsite is set in the native bushlands of the park and has the feeling and look of the grassy school campsites of a bygone era. Stockyard Camp is the starting point for the Drift Track hike, a 3 kilometre walk exploring the amazing sand dunes of the area, the largest being Big Drift. This walk will also provide you with a prime example of the variety of landscapes to see in the park. The walk will take you from desert-like inland areas to thick bushland and will give you extremely spectacular vistas across Corner Inlet, from there you can view the wonderful Cape Liptrap and Shallow Inlet, two more places to explore on your hike. It can be extremely windy in the area, so be careful, especially when in the sand dunes. As it can be very easy to get lost, make sure that you mark your trail so you don’t have any difficulty finding your way back. Another popular hike in the Prom is the “Squeaky Beach” walk. The sand on squeaky beach is all evenly sized grains, so when you walk on them they rub together to make the world famous squeaking sound that you will hear on the hike. It is only a two and a half kilometre trek and should only take you 50 minutes, but don’t rush, after all you are on holiday and should take in as much of this wonderful place as you can. 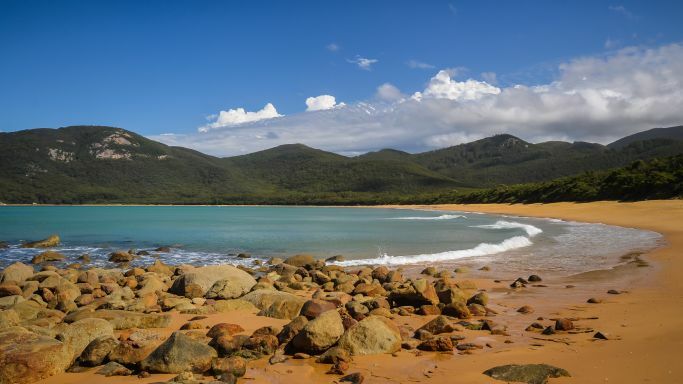 This walk begins at Tidal River Bridge and will take you over the headland that separates Norman Bay form Leonard Bay and gives you amazing outlooks over the western side of Wilsons Prom. For more information on the Tidal River to Squeaky Beach walk, check out walkingaps.com.au. Wilsons Prom has so many walks and tracks that it would take you weeks, if not months, the explore them all. One of the most wonderful things about these fantastic walks is the wild life that you will come across. 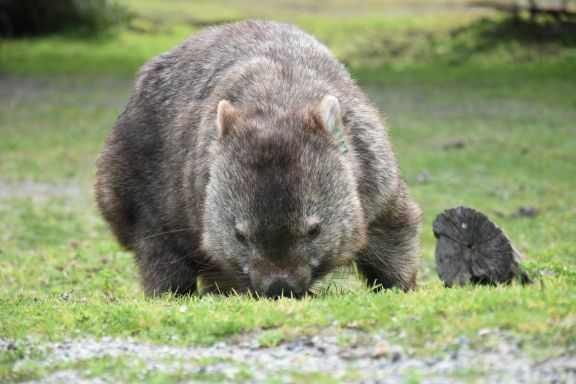 Kangaroos, Emus, Wombats just to name a few are all there for your pleasure, a wonderful way to appreciate what Mother Nature has to offer, and it’s all only a few hours from Melbourne. If you are an avian fan then this will be paradise for you as the birdlife in the park will leave you breathless. If you are planning a visit to Wilsons Prom, especially in peak seasons, then you must book well in advance. If you are holidaying outside of these selected times, then the booked sites are un-allocated, therefore the “First come, First served” rule operates. During the summer period a ballot system applies. This period is for the five weeks from Christmas to late January, and has a minimum stay requirement. You must apply for your chance to stay at this time, and applications are taken any time in the month of June. You must apply online, the details can be found at peak season bookings prior to the application’s opening. As there are so many accommodation packages available at Wilsons Prom your best bet is to visit the Parks Victoria website parkweb.vic.gov.au for their complete list of the different sites, lodges and other accommodation options, or call them on 13 1963 from within Australia, or +613 8427 2002 if you are enquiring from overseas. Wilsons Prom is one of the most beautiful national parks in Australia, and has so much to see and do that planning your visit is vital. If you are only staying for the weekend then enjoy your time there and relax in the arms of nature’s unspoiled beauty. If you are planning a long stay then consider camping at several different spots in the Park. Maybe a day or two at The Stockyards to familiarize yourself with the environment, then perhaps move on to Telegraph Saddle for a night or two. Then finish off at Tidal River, where you can base yourself and explore the rest of the park from there. If you are towing a caravan keep in mind that Tidal River and The Stockyard are the only two places in the park where caravans are permitted. But don’t worry, there are many more areas where you can pitch a tent, sleep under the southern night skies and marvel at the stars above. Remember to bring everything that you will need for your stay, there are certain things available, but it is always better to be prepared for the unforeseen when camping. Once you have visited Wilsons Prom, you will want to return again and again, as there is just so much to see and do. The most important thing though, is to just enjoy your stay, and take in all that it has to offer in this very special location. All images courtesy of parkweb.vic.gov.au.